There is a nip in the air this morning but the sun is out and clothes will go on the line. A friend is coming down to load her truck up with manure so that will be gone. Yea!!!!! 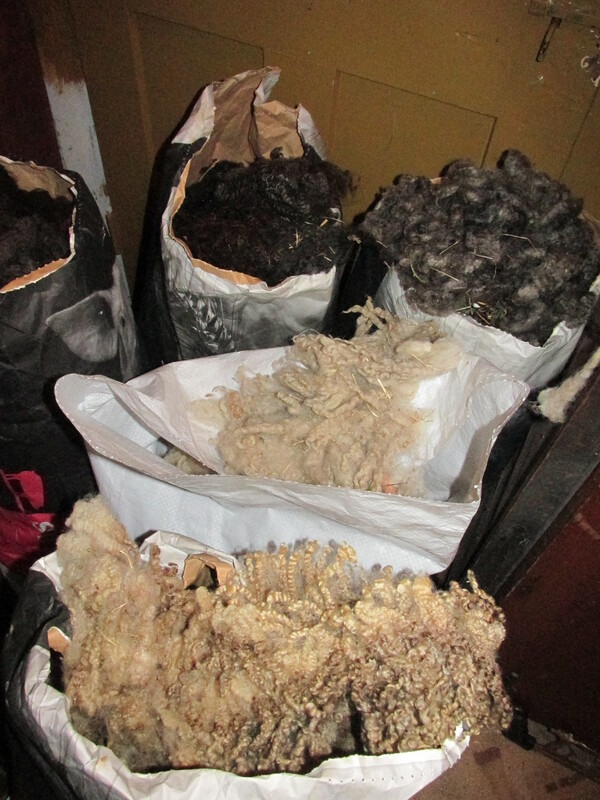 A couple of days ago these wonderful English Leicester fleeces were left on my porch by a friend Ceacy. 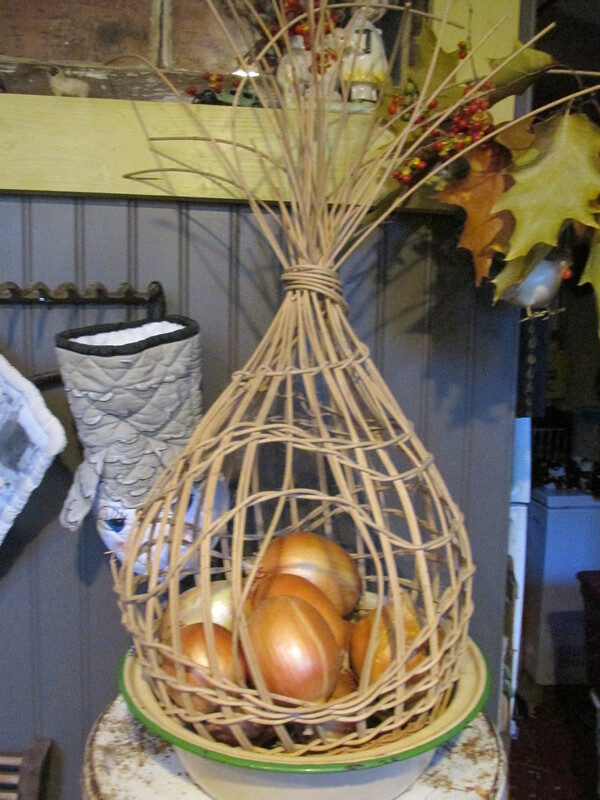 A few years ago I decided to make this wonderful Onion basket. I was making a smaller version to hold garlic in. I never used it because of little counter space. So it was hung up. Now with the renovations I have a perfect place for it. 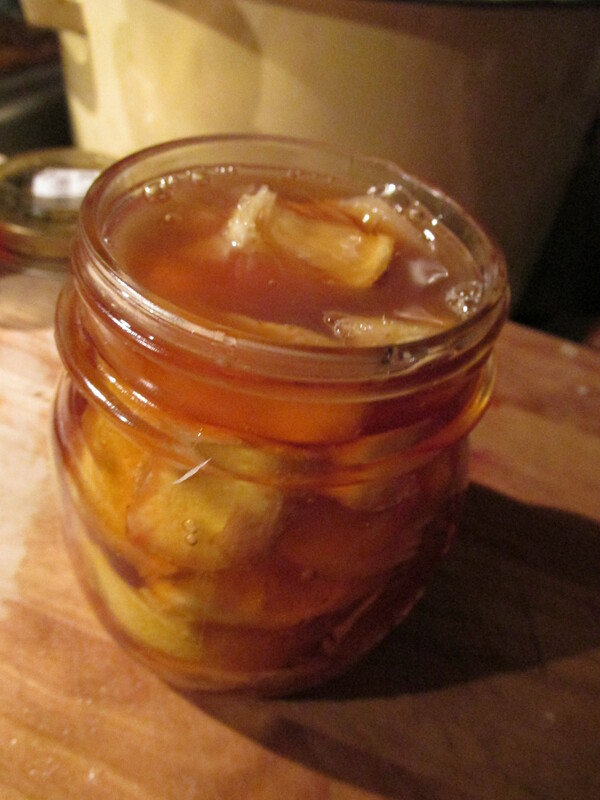 With cod and flu season upon us its time to make my favorite tonic. I have it brewing in the fridge and will start taking it today. For those of you who would like to make it, here is what I do. 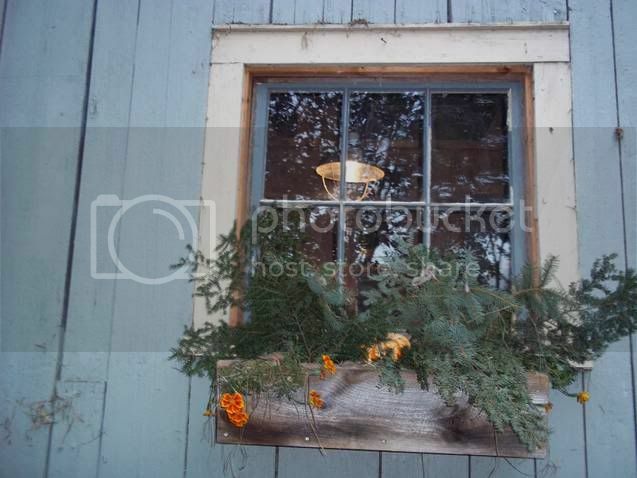 A smallish jelly jar works well for this. I layer lemon/ginger etc and then cover with honey. Place in the fridge and I take a teaspoon every day. Thank you all for the kind words about Marley they were so comforting. 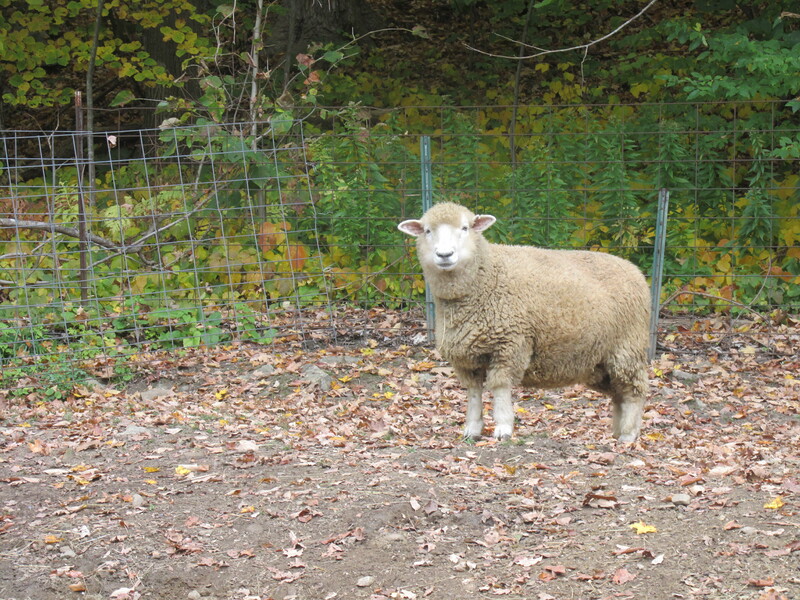 The sheep have not adjusted to his loss yet. He was the boss of where they ate and where they slept so it will take time.. After a very rainy day yesterday it will be sunny and in the 70’s today. Clothes will be hung on the line today. Deb and I gave been going to this event since 2004. We look forward to it all year and when it comes the day seems to fly by. Debbie calls it her Christmas and I call it my Birthday. It is always around the time of my birthday and yesterday it was on my birthday. Leaving the house shortly after 6:30 am this is the sight I saw and the picture just doesn’t do it justice. 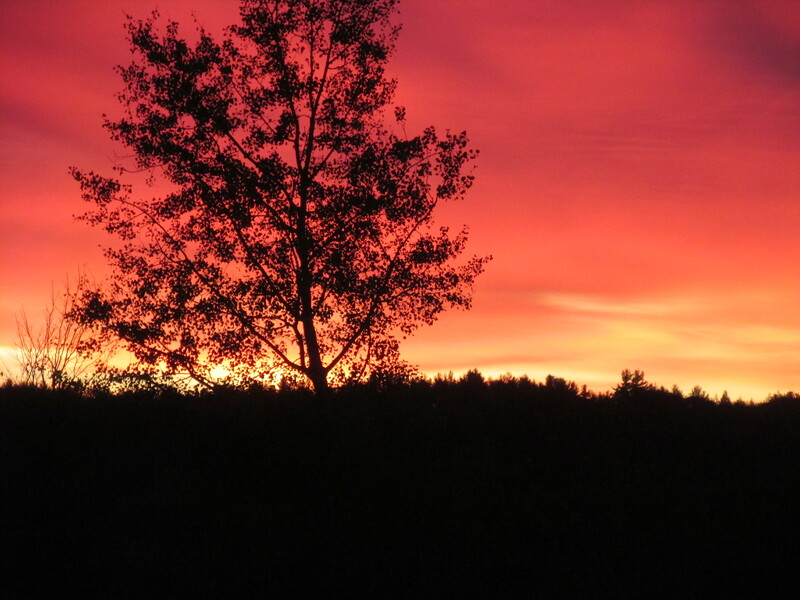 It was the most beautiful sunrise I have ever seen. Everything about this day is wonderful. 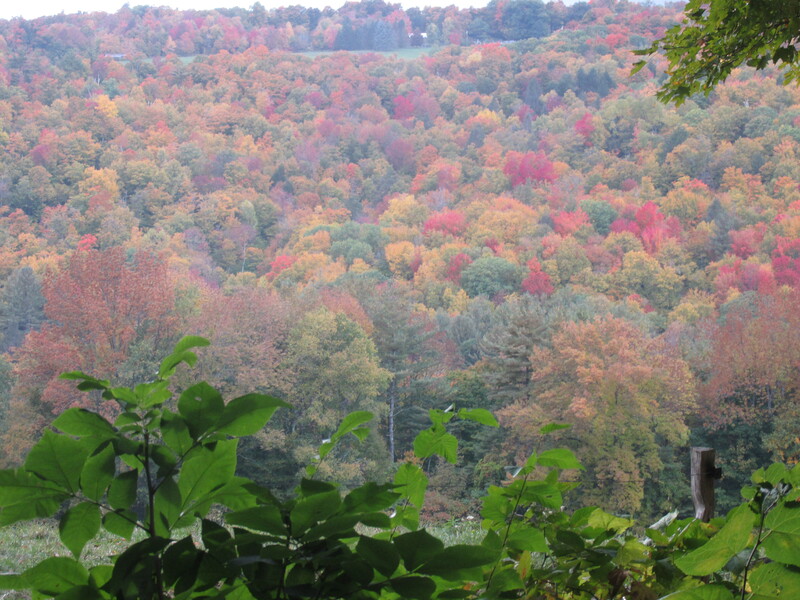 The ride from Debbie’s house meanders on back roads with farm land and woods which were colorful. The inn itself is very old and has a sense of comfort about it. We settled in our favorite spot and hooked the day away. A wonderful lunch with homemade apple pie and whipped cream for dessert was enjoyed by all. The vendors enjoyed brisk business and Mary Jane bought some delightful punch hooked things. I don’t see Mary Jane often so it is wonderful to spend and entire day with her. This is the only thing I purchased yesterday. I have been looking for one for over a year. It was a reasonable price and this is what I wanted it for. A drawer full of pot holders is not convenient when you need one right away. I am so blessed to have wonderful children who each have helped me along this path of life I have chosen. Thank you Cindy, David and Betty and their spouses for supporting me and helping me.I am ever so grateful. 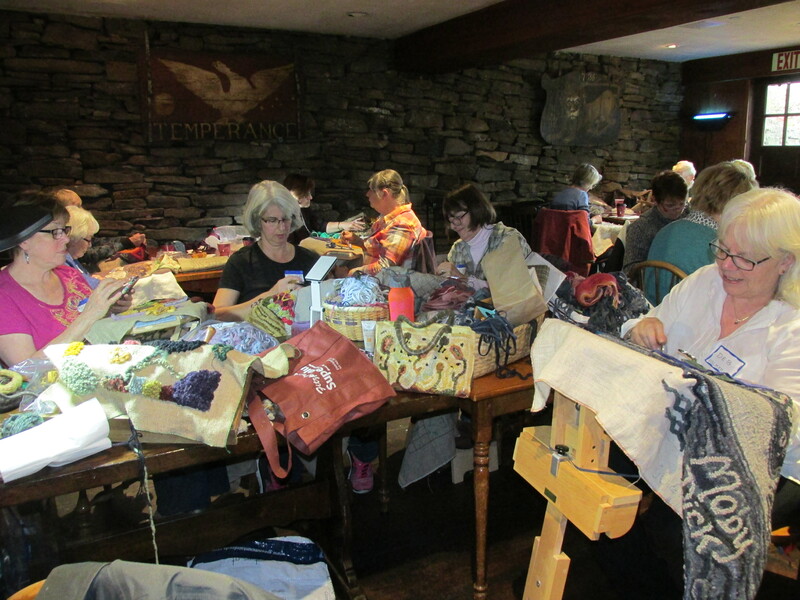 Thanks Woolen Memories for holding such a wonderful event. Its a big undertaking and you do it flawlessly year after year. It is with great sadness that I tell you that Marley crossed over the rainbow bridge tonight. He was an imp and I will miss him terribly. Only three days ago he was fine wanting me to scratch him and running about. I noticed something was not right 2 days ago so the Vet was called. A wonderful new vet named Stephanie Vasser came and checked him out. He had stopped eating by then she thought it was a urine blockage. She gave him a pain meds shot and we hope it would correct itself. He hadn’t eaten in well over 24 hours and was in pain so the decision was made. There was no way for him to come back unless he had an operation which in the majority of cases doesn’t work. I am sure he is running around with his friend Elliott on this starry night. Losses are to be expected on a farm, it doesn’t make it any easier. 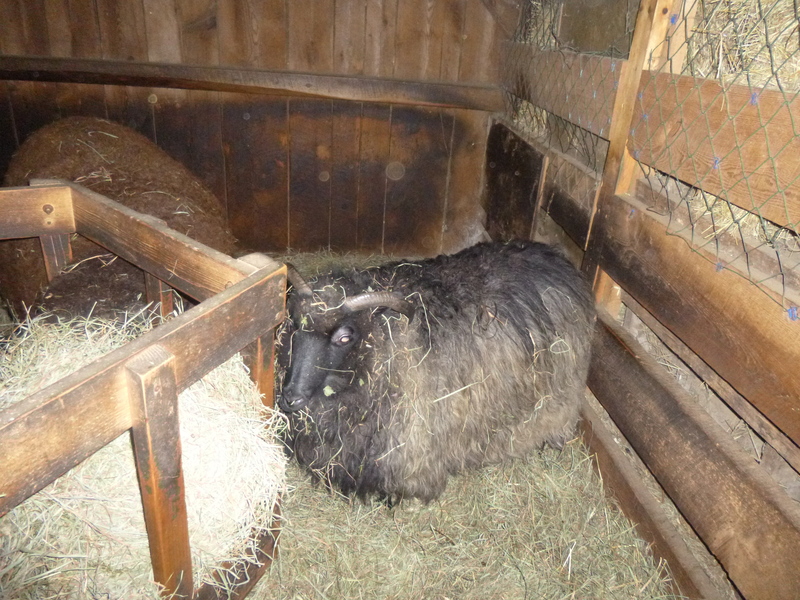 The death of any member of my farm family is a loss The barn seems bigger now with two loses within a 6 month period. We had a warm spell yesterday but a frost last night and we will be in a cooler pattern for the next week. I have been spending my time trying to get the house buttoned up. Windows closed and some covered with plastic. I love the fall but its full of busyness. Yesterday I spent most of the day getting ready to bring the outside chickens in . The screen door which separates the two flocks needed to be repaired and the Waterer needed to be put in a different place and feeders put back up. 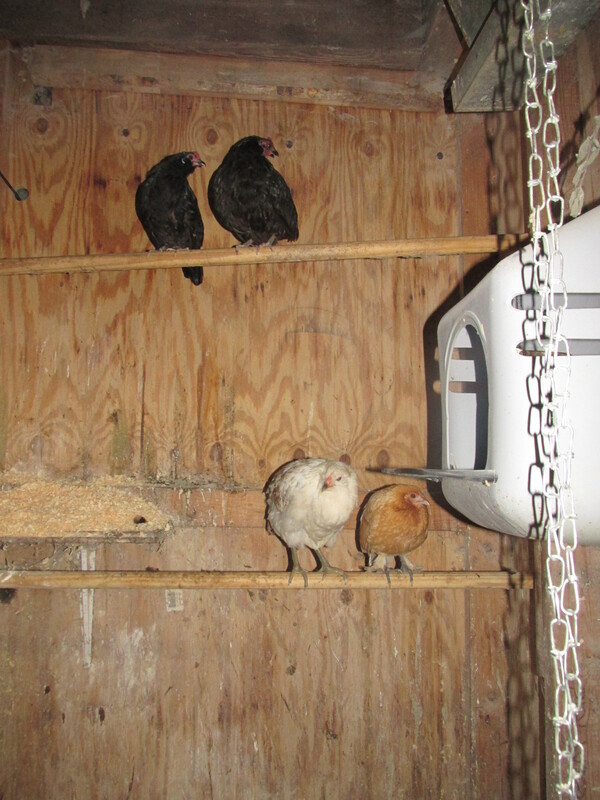 Last night I bought the two new hens and Morticia and Violet in. They quickly settled on the perches. This morning I tried to catch Eddie with no luck. I did get Gladys so she is in. Three more to catch within the next few days. 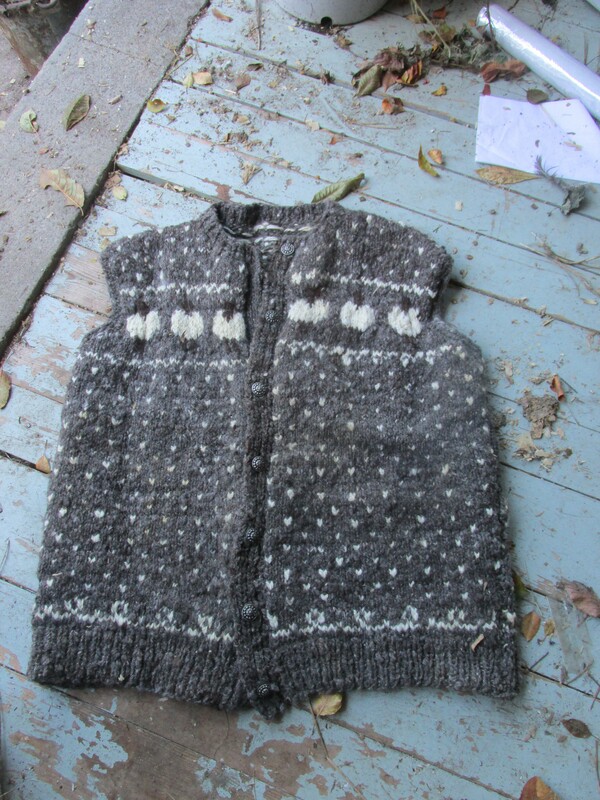 I made this many years ago and have hardly worn it. It started off as a sweater but then was made into a vest. The yarn is thick and the vest is toasty. I rarely wear coats in the winter now, I do prefer heavy sweaters or vests. This is my latest project for fall shows. 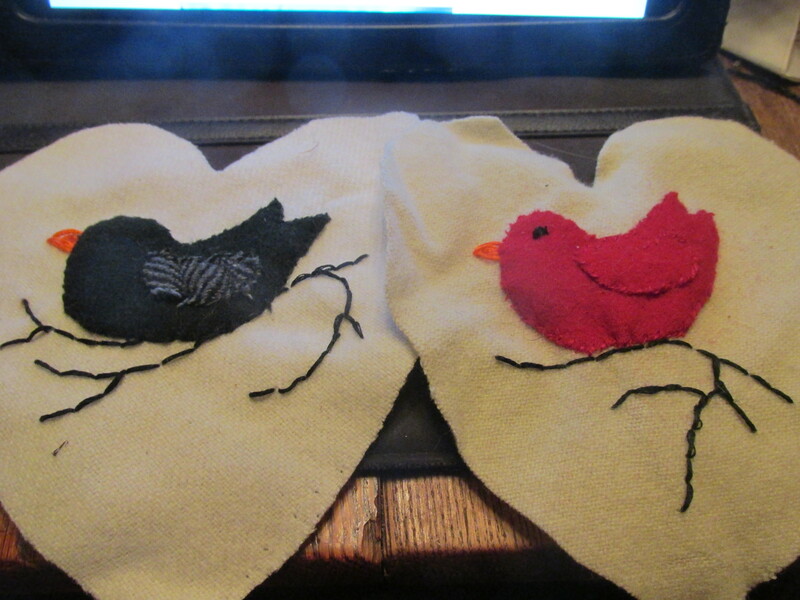 Woolen hearts with sweet little birds on embroidered branches. 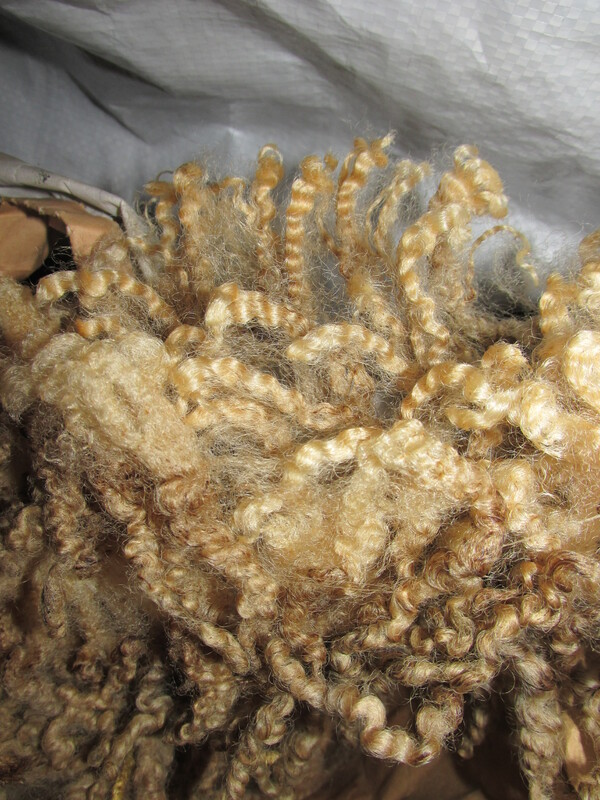 They will hang with some twine and be filled with balsam. They are fun to make and I quite enjoy the hand sewing. 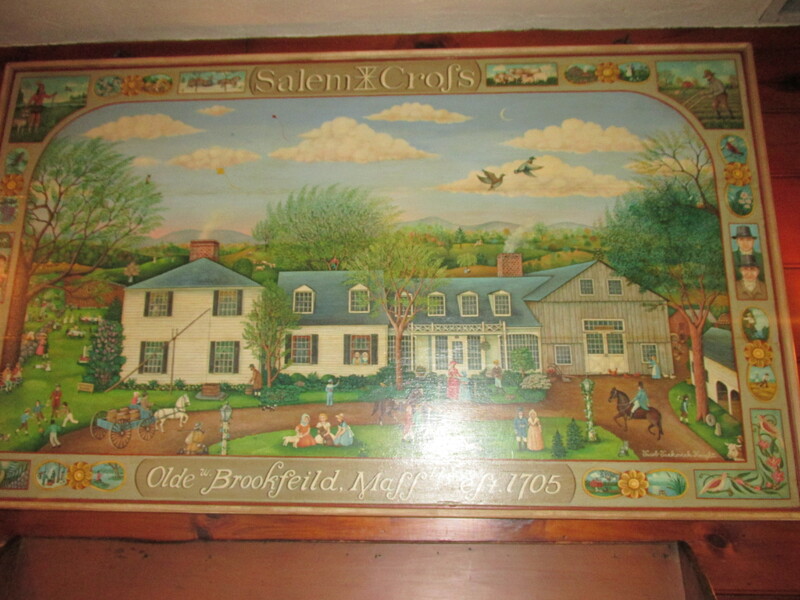 Next Wednesday we will be at The Salem Cross Inn for the annual Rug Hooking day sponsored by Woolen Memories Shop. Deb and I have been attending this even for years at least since 2004. We have so much fun and we catch up with friends that we only see once a year. 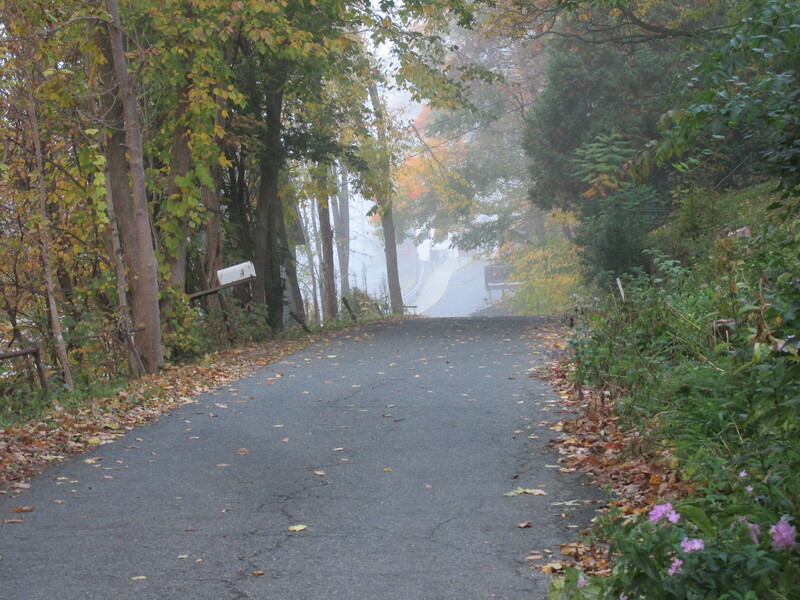 It’s very cool morning here with temps just rising to the mid fifty’s today. It will be cold weekend with some frosts coming. This has been tradition since I was a child. I have been out twice and will go out today looking for more. 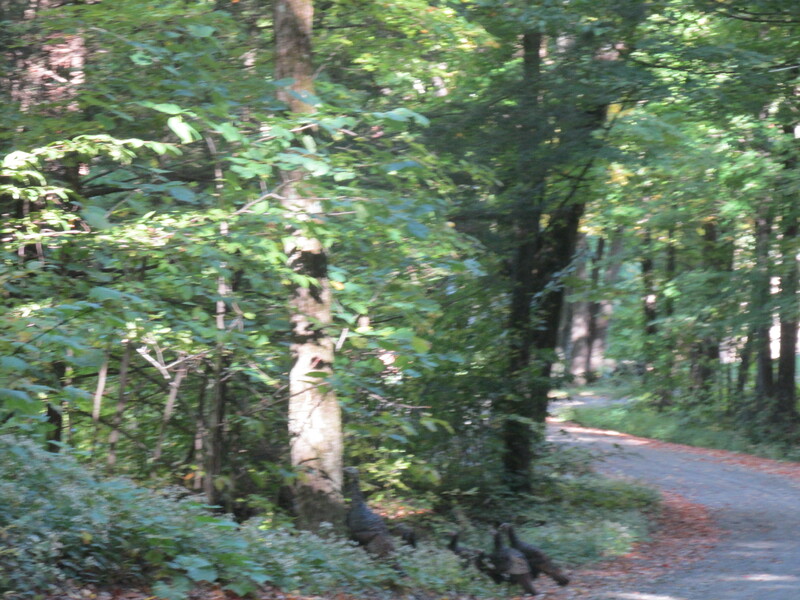 I especially am waiting for the oak leaves which offer an array of colors. They aren’t quite ready yet. It’s a wonderful thing to do with children, that is how I learned to tell a maple from an oak. My Mom would put a square of wax in an old pan and put the pan in simmering water so the wax would melt slowly. We would have cookie sheet lined with waxed paper at the ready and I would hand her the leaves. She would carefully dip them into the wax and hand them to me. I would let them drip and lay them on the sheet. 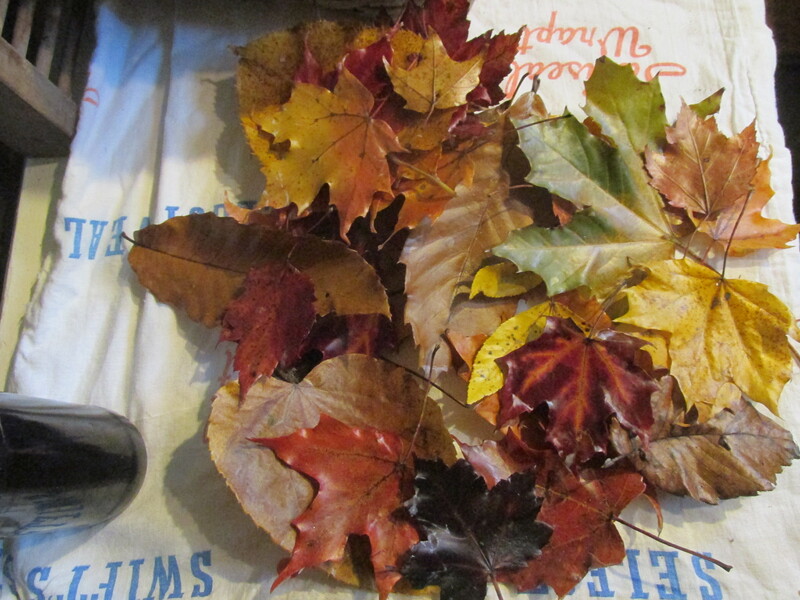 These leaves would be used in decorations around the house . Years later I would send her waxed leaves when she lived in Florida and missed the fall. Another method of preserving leaves is with glycerin. 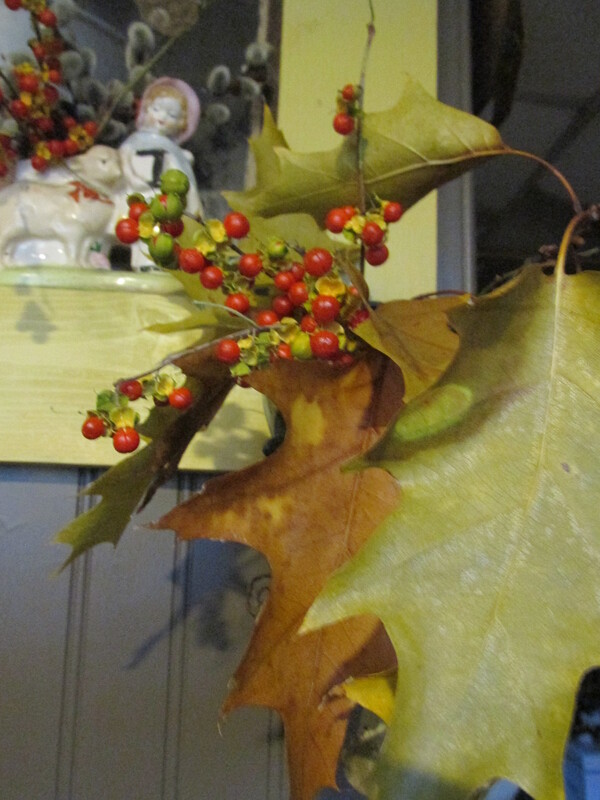 I have used this method to preserving the leaves right on the branches. Happy leaf hunting. Cindy often sends me things from my beloved Ireland. This time it was the cherished items that we loaded our suitcases with . 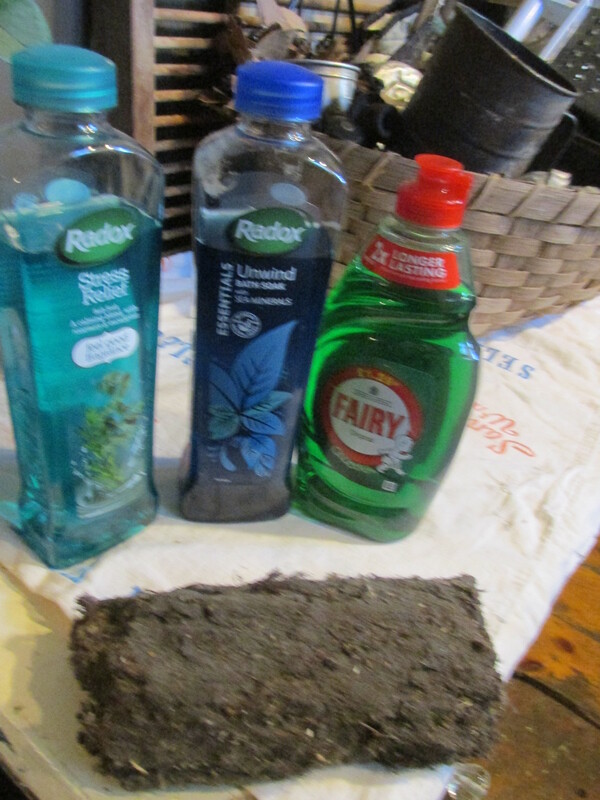 Fairy Liquid and Radox. Since we have rented houses in Ireland for the past 20 years we have to supply the simple things such as dish detergent and groceries. When I smell the above two products it just sends me back to the place I love. Thanks Cindy. Now to light up a brick of turf and I am happy. My kitchen has needed renovation for years. 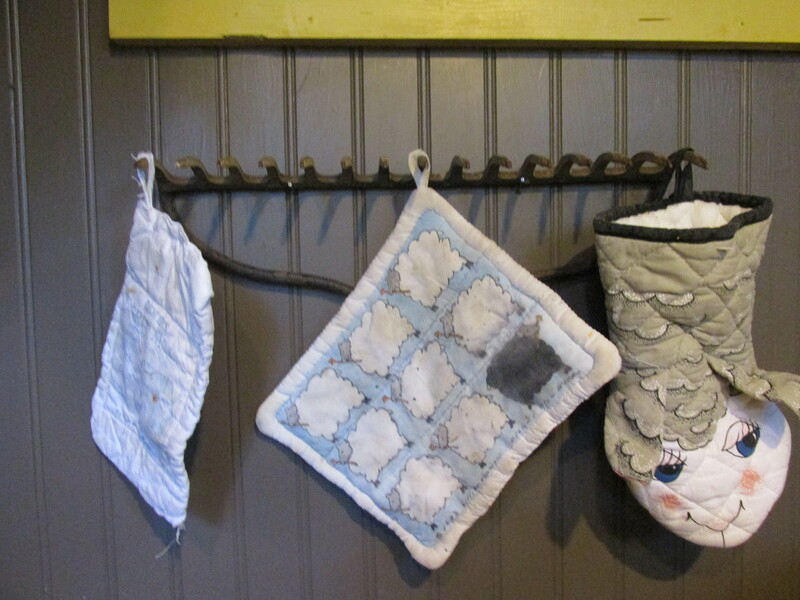 There has always been more important things to fix in this old farmhouse. I have bought a double Soapstone sink for $75. many years ago and it sits in the downstairs barn area waiting to be installed. Maybe next year that will happen and it will make , canning, dyeing wool and making soap so much easier. But for now I am fixing up some of the walls with beadboard. 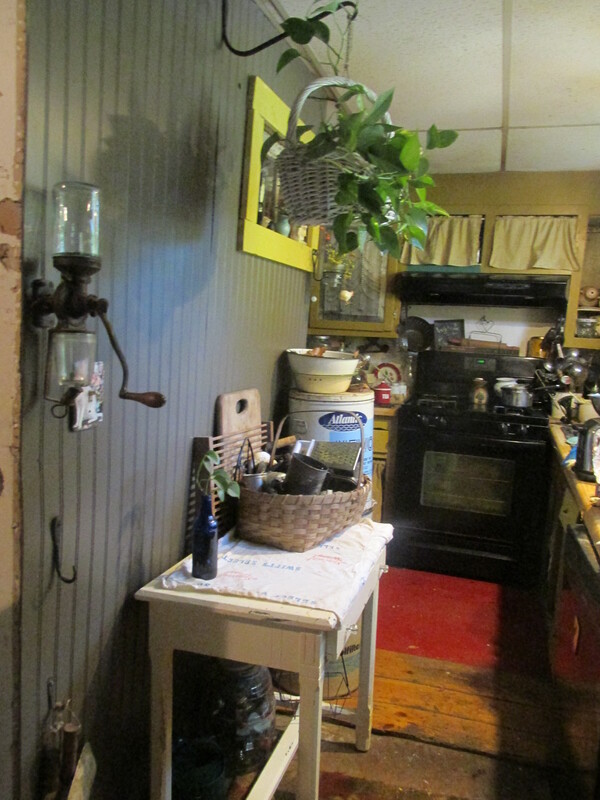 I am inspired by Kristen Nicholas with her colorful farmhouse and using colors that I would not ordinarily use. Chris and I started this project while he was here. 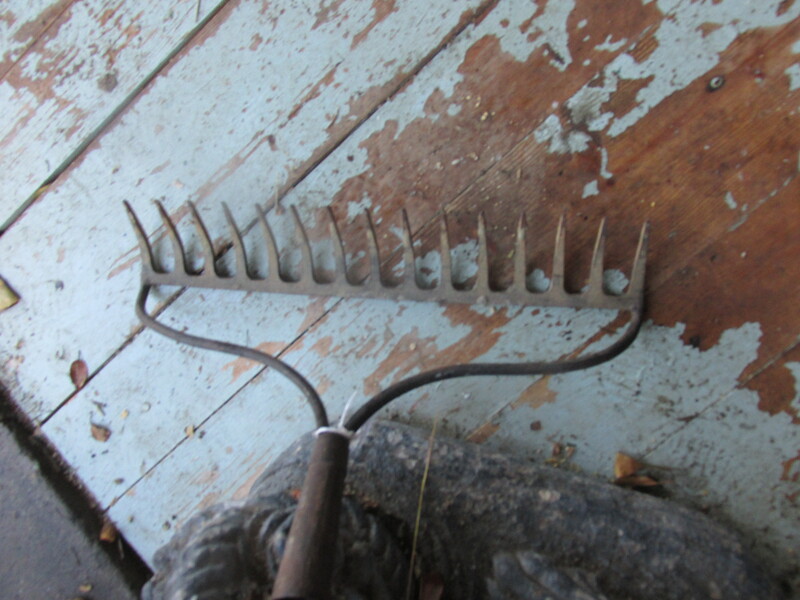 Neither of us are carpenters but we forged ahead and got it done with . One wall done and painted. I hope to get another wall started today. It will probably take most of the winter to get all the walls done and painted. Some of the walls will have beadboard only half way up and the upper walls painted another color. I am going to paint some sunflowers on the walls , thank to you Kristen for the wonderful ideas of color and design. Look for more pictures of my progress in the future. 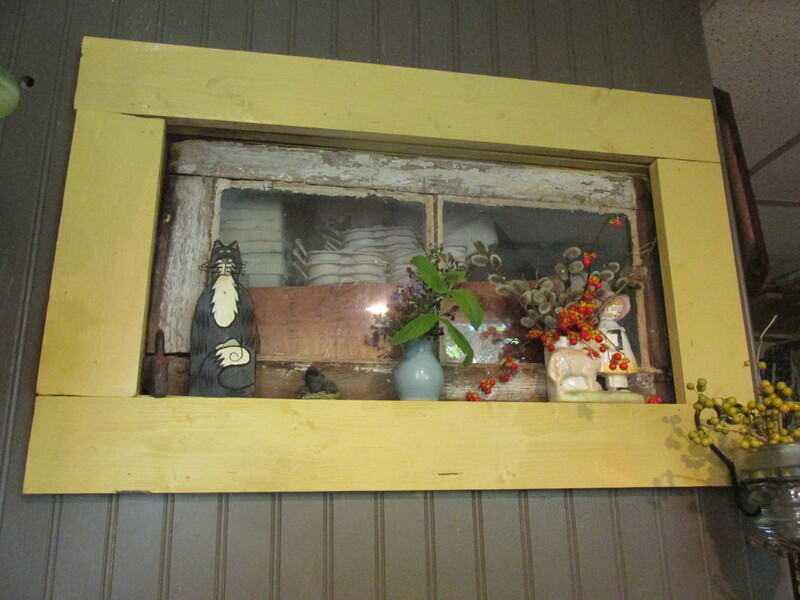 The small window comes from my Great-Grandmother’s house i Maryland. When they were tearing it down I saved some of the windows. 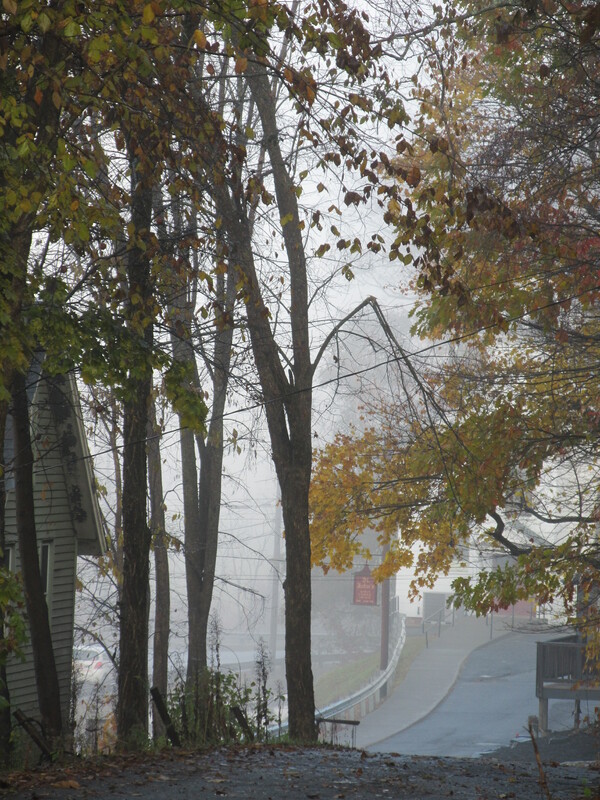 A very foggy morn today, you can hardly see the Church at the end of the street. 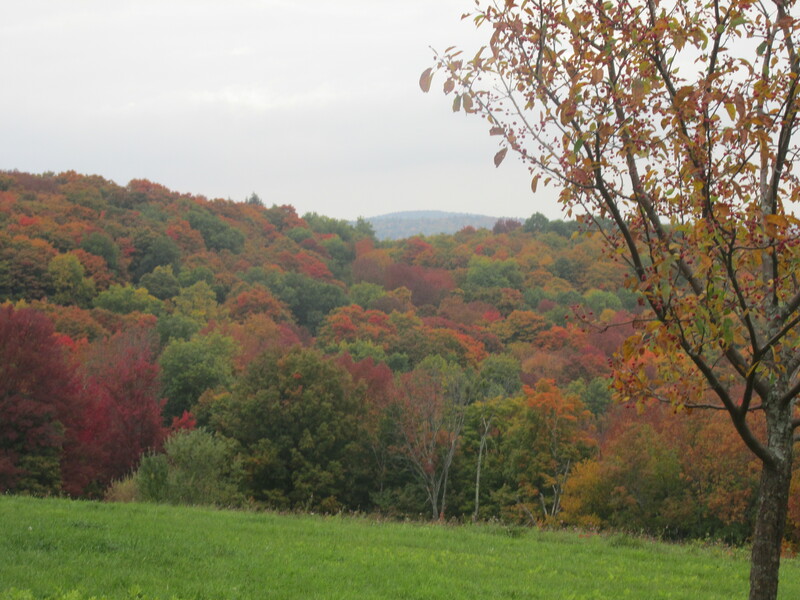 We are expecting a frost on Sunday night with temps in the high 20’s. 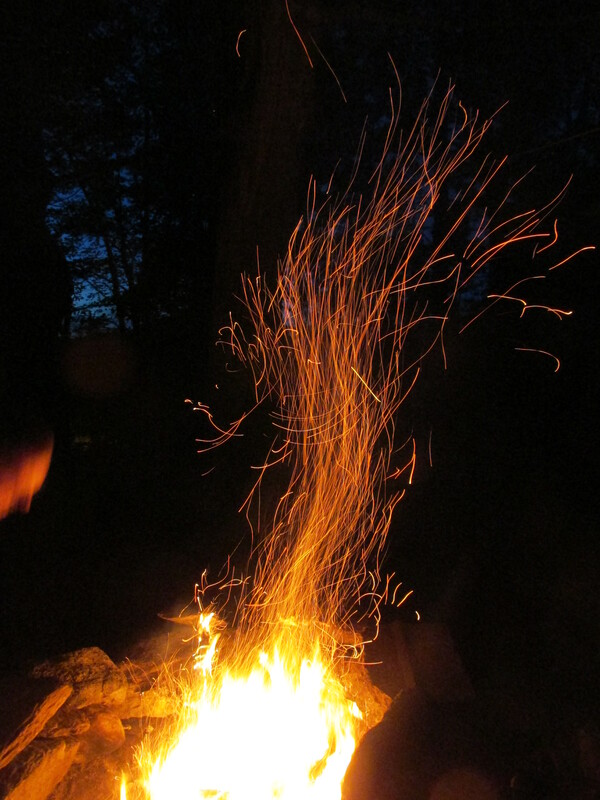 Then another warm spell. The chipmunks and squirrels are busy as can be gathering up nuts and seeds for the long winter ahead. 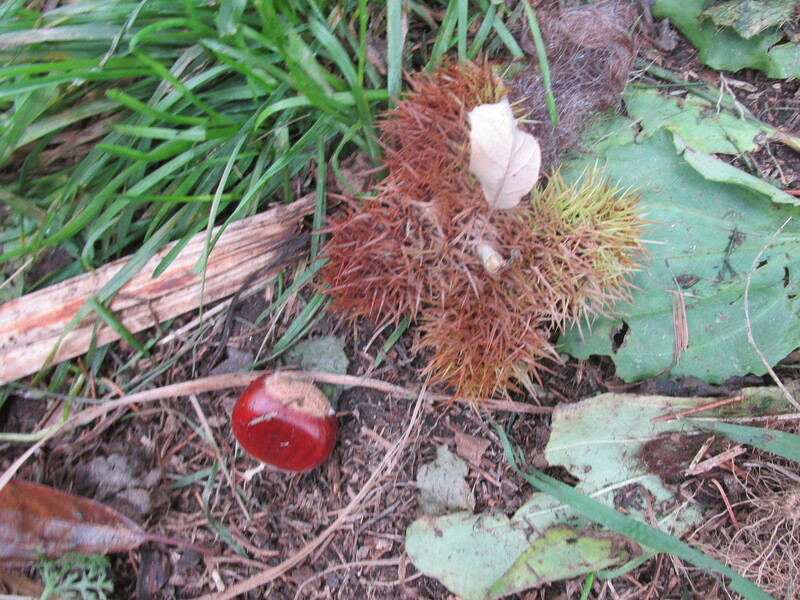 The sheep have enjoyed an abundance of acorns this year and are putting on their winter coats. 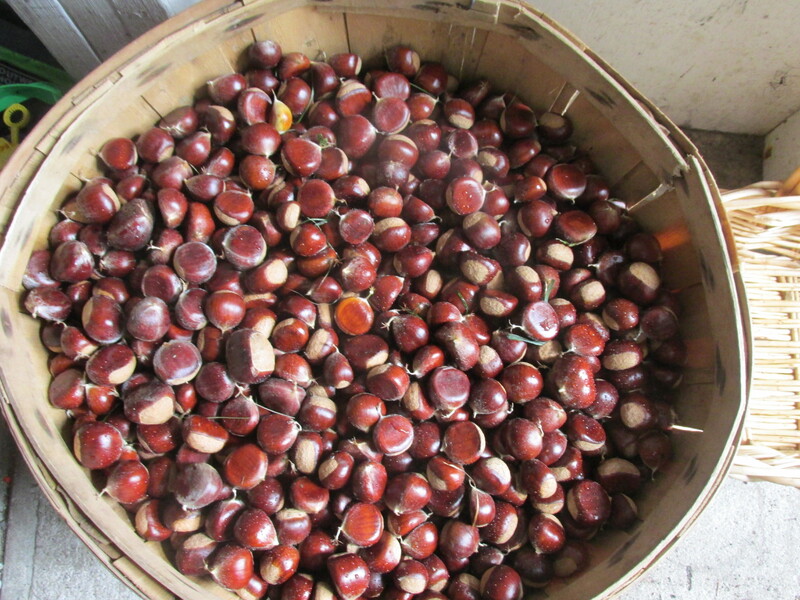 There are 4 American Chestnut trees on my Son’s property. His family has already sent out 40 pounds to a restaurant in Cambridge, Ma. And have almost 50 pounds more picked with many more still falling to the ground. 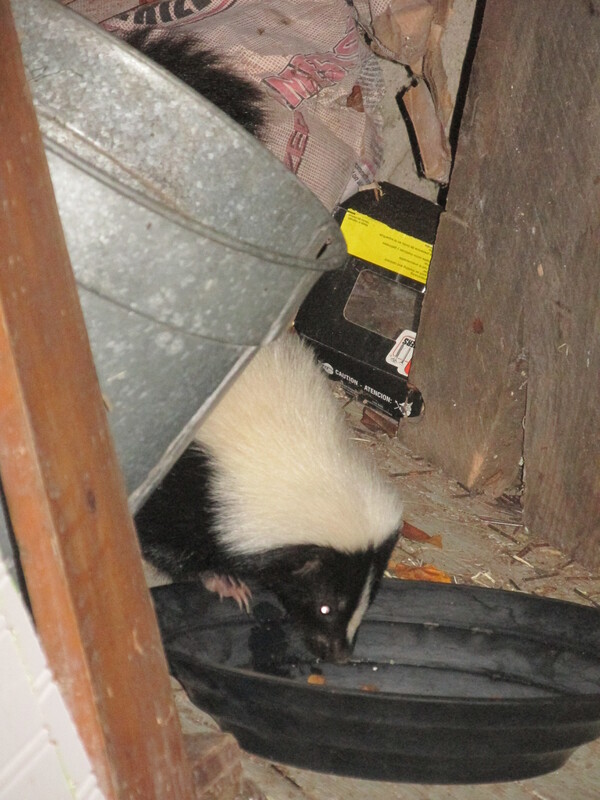 He is back and caught in the act eating food put out for a cat. I love having him around he keeps he farm free of rodents. Both my son’s family and myself have been putting out food for a cat who doesn’t seem to have a home. 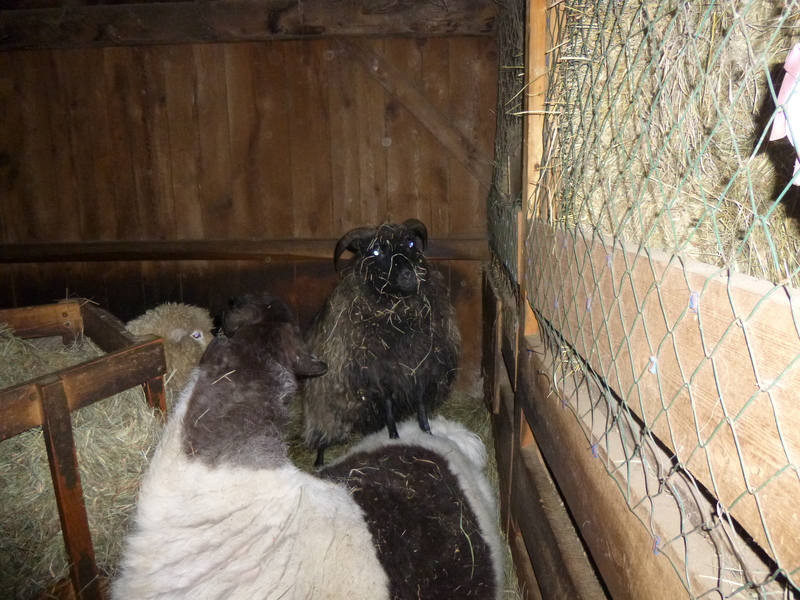 I am sure its a she and we would like to catch her and bring her to the vets. Too many people still dump cats and its such a shame. There are so many places that will find them forever home. I hope we can catch her soon. 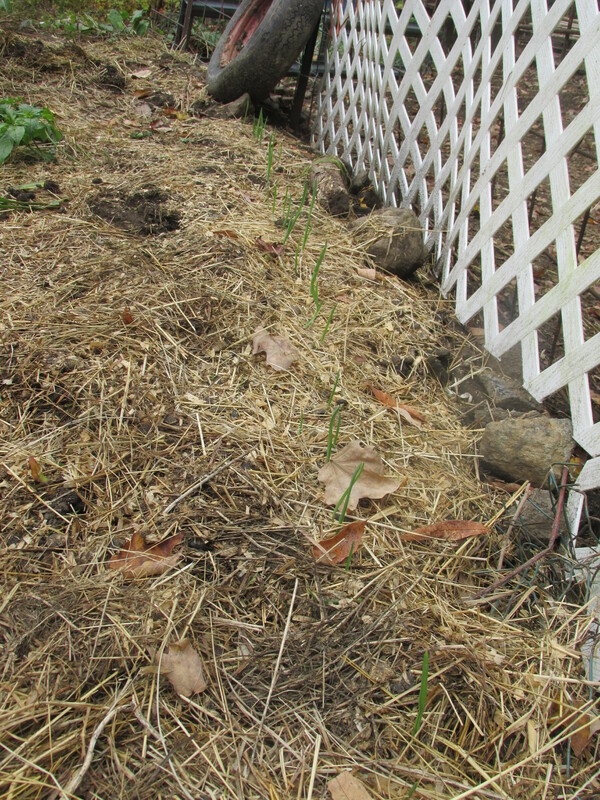 The garlic has come up which is good. I still have some more to plant and hope to do it soon. 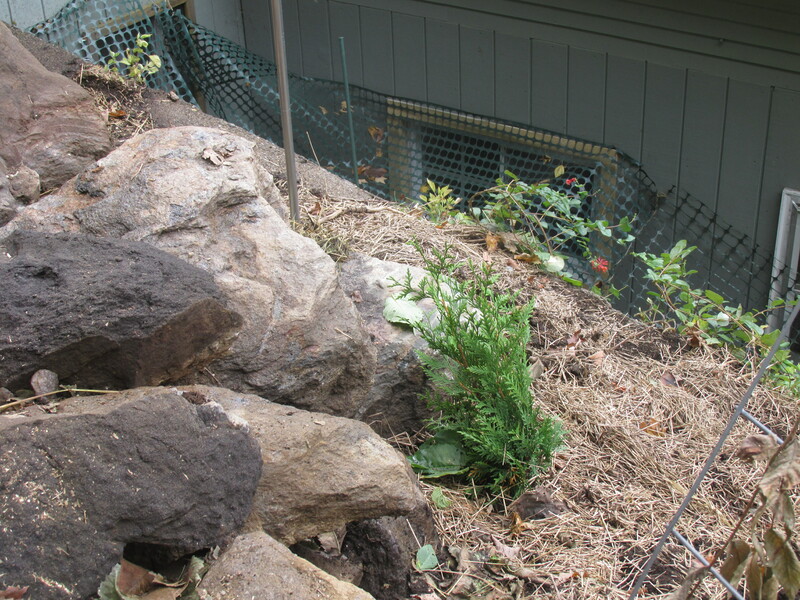 Plants are on sale now so I bought this small arborvitae and planted it near the newly deposited rocks. It will grow quickly and will be a safe place for birds in the back yard (right near a bird house) and I plan to put some twinkle solar lights on it when it gets bigger. So nice to look at on a cold winters night. 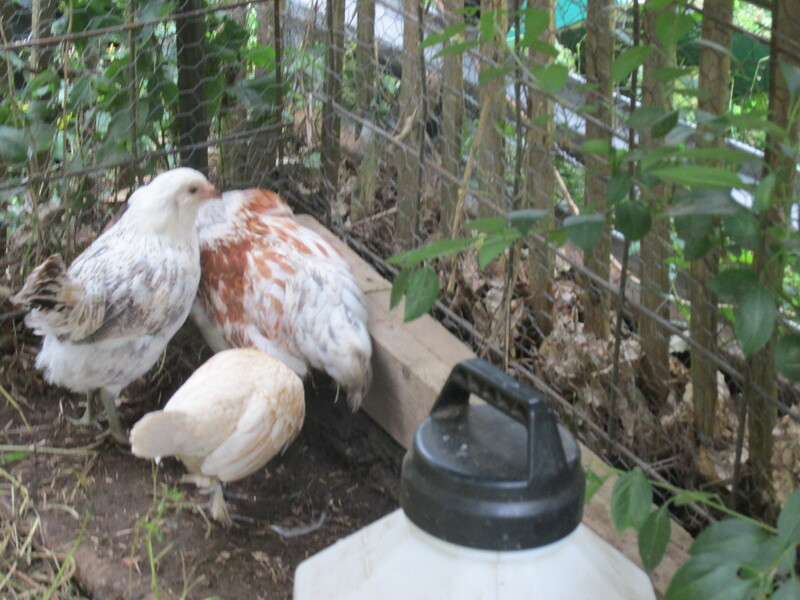 Dorthy, Emma and Rosemary are doing very well. All the side yard hens are together now and the pecking order has been established without any bloodshed. They will be coming inside in a couple of weeks. I will batten them down with lots of hay for the frosty Sunday night. We had some needed rain on Friday and a hint of frost last night. Another beautiful fall day. 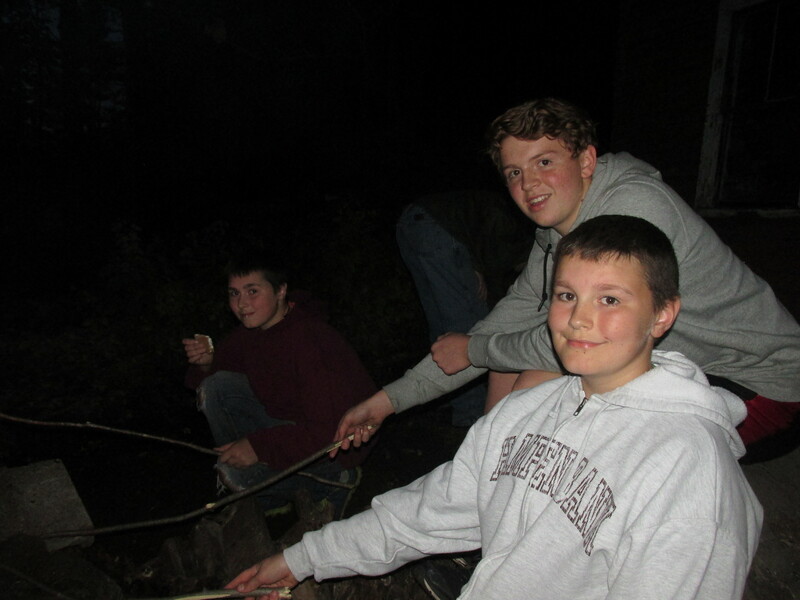 Chris is here helping me and we had a camp fire at my son’s house last night with S’mors. It is the simple things in life that mean so much. 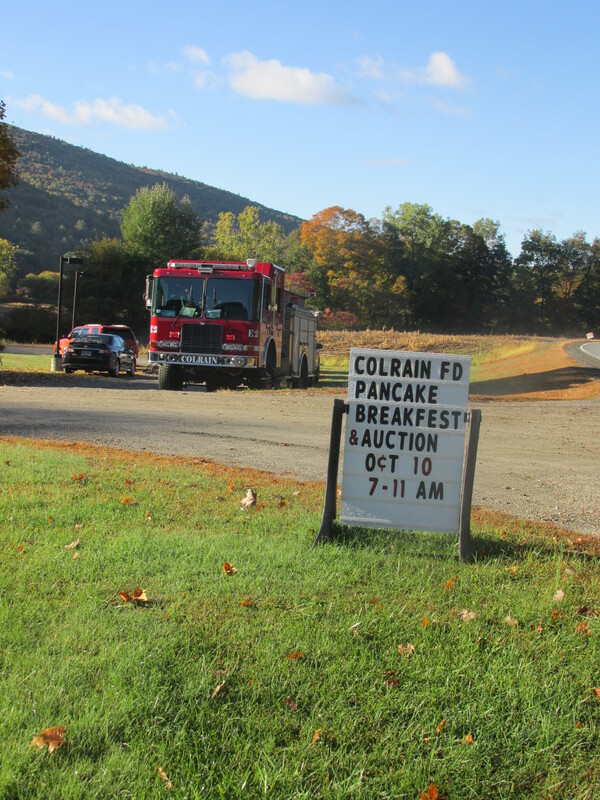 A few times a year the Colrain Volunteer Fireman have a pancake Breakfast. 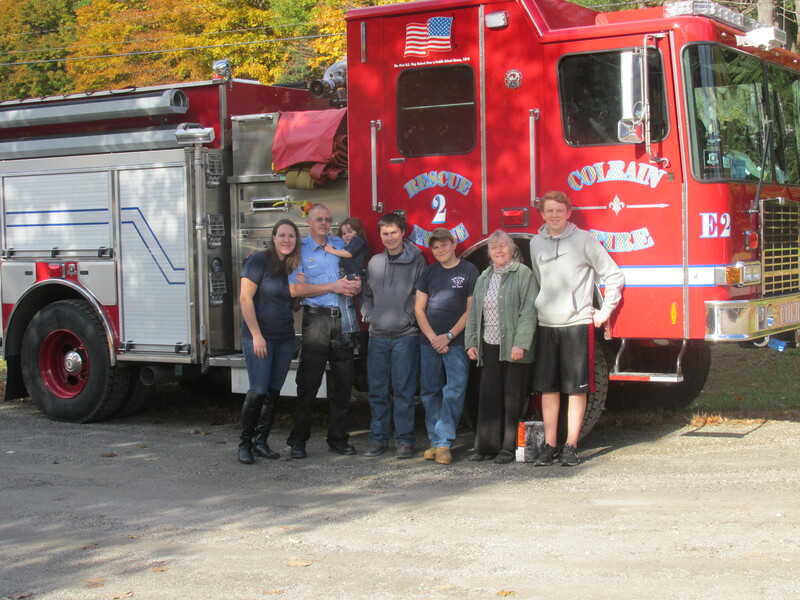 It’s a way to support the good works they do and help them get new equipment. Another exquisite show from British TV. I was able to watch some of the first show online and will finish watching it soon. The second show will be on PPS at 8 pm our local time. Check you local PPS station near you. The scenery and acting are wonderful.